Justin and Annette met at their fire academy when they both got hired by the fire department. They met for their first date on June 18th at Tony Romas Steakhouse which they followed with a walk on the beach, and they began dating on July 1st in 2012. Justin proposed in 2017 during an amazing day at the iconic Blue Lagoon hot springs in Reykjavic, Iceland. While taking photos he got down on one knee holding a beautiful engagement ring. Annette said, “There was now a little bit more ice in Iceland”. Both Justin and Annette come from different backgrounds and customs, so they knew they wanted something less traditional for their wedding. They chose a destination wedding because it signified their love for travel. Annette said, “What better way to celebrate our love with something we love; travel”. 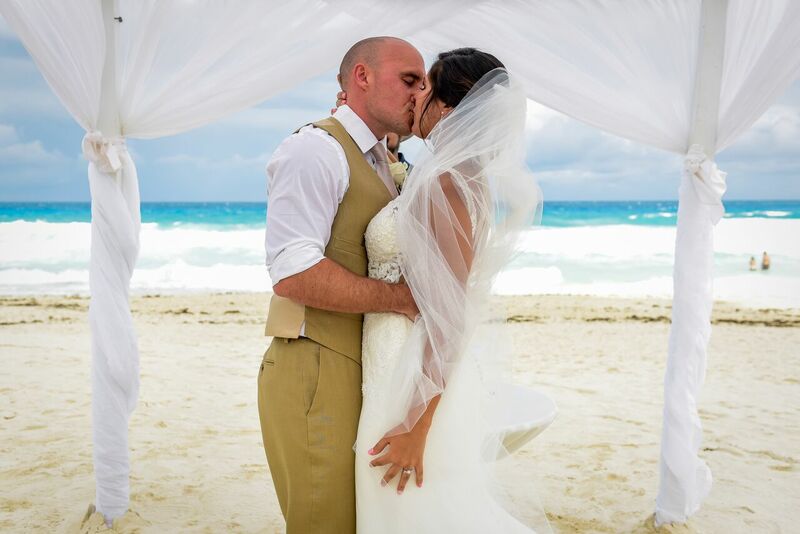 Together with their Destify agent Michelle, they chose Sandos Cancun Lifestyle resort in Mexico. A big selling point of the resort was that is was smaller and more intimate. They found many reviews online from happy brides, plus it was more affordable for their 63 guests. The location was unbeatable too, situated by the Nipchute lagoon and the Caribbean Sea. The day of the wedding was nervewracking, as the previously beautiful weather of the week turned to high winds and lots of rain. Their photographer told Annette about a superstitious Mayan belief, that you can stick scissors in the sand to ‘cut off the rain’. That’s what Annette did, and luckily the rain took a reprieve for the duration of their ceremony. They held their ceremony on the beach, and they exchanged their vows and took pictures on the beach before it started to rain again. They quickly met up with their guests at the cocktail hour, featuring more pictures, cocktails, and tequila shots. The reception followed, and although it was unable to be hosted on the terrace as they had originally planned due to rain, their new venue still had panoramic views of the ocean. Annette’s Hawaiian coworker did a traditional Haka Chant, and his wife performed a love hula dance, moments that were emotional to everyone involved. The reception continued with a fun night of dancing. Annette said, “There wasn’t a dry eye in the room”. The couple agreed that destination weddings may not be for everyone. Their advice is to be patient and to trust your wedding coordinator. Communication and trust are key for a successful and wonderful destination wedding. A rainbow appeared after we said ‘I do’, if that was not a sign of a beautiful life ahead, I don’t know what is.